Regretfully we have decided that it is not the right time now to hold this event over the weekend and will postpone it until after Easter or early in the new Season. MDM are a valuable sponsor and we want to ensure a successful event for all of us. Junior Training continues at the club this Sunday from 10h00 for the Optimist Classes. This Sunday there will be racing at the club with Round 4 of the Summer Series being sailed starting at 10h30. 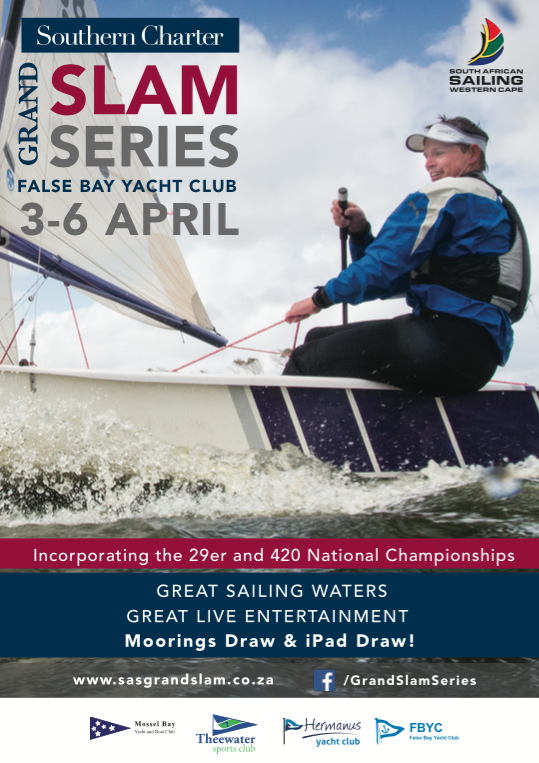 Just 2 weeks left to enter the Southern Charter Grand Slam Series, Round 4, at the False Bay Yacht Club. 3rd – 6th April. As with all big events, the organizers SASWC and FBYC are frantically looking for all kinds of helpers: Bridge, Rescue with crews, Mark Laying Boats and crews, Protest Panel Members, Equipment Helpers and Shore Crews for handling boat parking and launching dollies. ZVYC Club House will be closed from Friday 3rd April to Monday 6th April. Members may still have access to the grounds and outside change rooms. The Club will be holding its Annual General Meeting on Thursday, 14th May at 19h30 at ZVYC. Please note the attached selection, 11 WCR kids chosen to tour with the SA squad this European summer, well done to them all. Special congratulations to the sons of our members, Peter Baird and John Innes;they are following in their fathers footsteps and we can expect some quality rowers joining Alfreds in years to come! Me thinks the Family Race at our next regatta could be quite an event, what with the Brummers buying boats and training furiously…! Kaamil Adams (16), of Grassy Park Rowing was placed 3rd fastest single sculler of the u19 clubs. I really want to thank all of you for the beautiful, memorable week-end spent together. This year I have seen all of you being so mature and independent with everybody knowing exactly what to do and kids even setting their own alarm clock a 3 o`clock at night, organizing their own just-woken-up-snacks and getting ready and wet-dressed, sun-protected and on the water without adult intervention, help and support! Wow! This was big motivation and excellent planning and self discipline, so amazing, I am really proud of you! This is really what sailing does to people and you kids are real sailors. I have also seen you so focused and motivated sailing in zero wind, mist, zero visibility fog, would be great to get your school teachers sometimes to come and witness what you guys can do with your focusing skills!!! The conditions were excellent and this allowed the introduction in the team of few non-sailors who got a full-immersion first experience and are now, despite to the cold and exhausting experience enthusiast about sailing and already planning to join courses and dreaming new sailing adventures. This is very positive. These new kids have been helped, supported, roughly dressed and quickly trained by the more expert kids and got perfectly part of Mamma Mia, with a spirit that has been noted and underlined more times by parents, coaches and even by the organization, well done, really! Would be great for next year to put together maybe two teams, introducing Mamma Mia Teens on a different boat… let`s see. Here I send you few pictures about the event, if you have more and really good shots, please share! We wish our members sailing in the Hermanus & IYC Club Championships this weekend, Good Luck and Fair Winds. See you all down at the Club this weekend!